Chicken in Broth is a wet food by Applaws. This food not only contains juicy chicken meat, but also vegetables and rice. These ingredients are brought together in a delicious broth in a useful portion pack of 70 grams. Chicken in Broth is available in three different flavours. 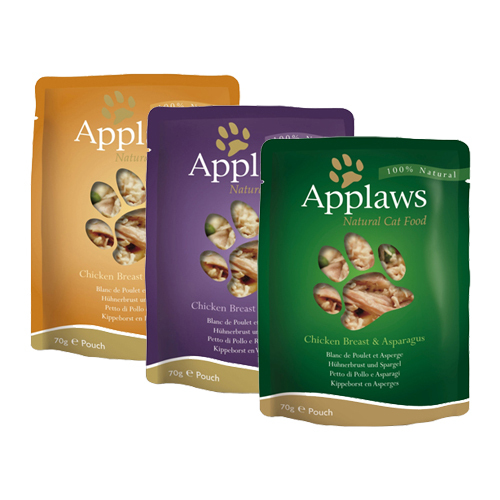 One pouch of Applaws Chicken in broth is packed with juicy chicken meat. The vegetables, rice and broth make this wet food a tasty meal for your cat. Each pouch of Chicken in Broth is naturally rich in taurine. This nutrient supports the condition of the eyes and is beneficial for the heart. There are three different flavours: Chicken Breast & Asparagus, Chicken Breast & Pumpkin and Chicken Breast & Wild Rice. These three flavours are available in a convenient multipack. You can find this here. Chicken Breast & Asparagus: Chicken breast (70%), chicken broth (23%), asparagus (5%), rice (2%). Chicken Breast & Pumpkin: Chicken breast (50%), pumpkin (24%), chicken broth (23%), rice (2%). Chicken Breast & Wild Rice: Chicken breast (75%), chicken broth (23%), wild rice (2%). Have you used Applaws Cat Food - Chicken in Broth before? Let us know what you think about this product.